"God you're high maintenance" said a man with laughter as he came to collect his Valentine flowers. I was giving him instruction on flower transportation at the time. Then another man came to collect his, he carefully unfolded a full colour illustrated map detailing three possible overnight flower storage locations. None were really right but with "high maintenance" ringing in my ears I though it best if he just didn't tell me. You have to let them fly. Of course, I can wax lyrical about the flowers, tell tales of customers, but we all know the day was really about the dog. "I'm calling from London" said a voice with more than a modicum of irritation and superiority. When people announce their geographical location it is to explain a bad phone line, a need to crack on with this as it is costing them a small fortune or an unfamiliarity with our native flowers. When they announce they are 98 miles due south, it is announce that they are more cosmopolitan, that they fear in the country we are all wrapping chrysanths in polyprop ribbon with a toothless smile and a limited vocabulary. I always choose to kill people with kindness in these circumstances, disarming them, and their preconceptions. The irony is I have actually grown some chrysanths, they went in late, so didn't reach the competition size I was looking for. Next year. In a time of blurred boundaries, seasons and timezones, when our language is as homogenised as our high streets, the divide between town and country remains. Kenneth telphoned earlier in the week to invite me to a luncheon, he explained that the guest list was to be comprised of "old fogies some half a century older than you, would you mind?" He has clearly never met any of my boyfriends. In other interesting things to think about I mentioned this article on instagram. An article on regret by Emma Freud. It led to some very interesting conversations in the shop, and I also recommended the podcast The regrets of the dying earlier in the year, and if you haven't listened to the series then do. We always regret the things we didn't do, rather than those we did, held back by fear, duty, uncertainty, vanity. 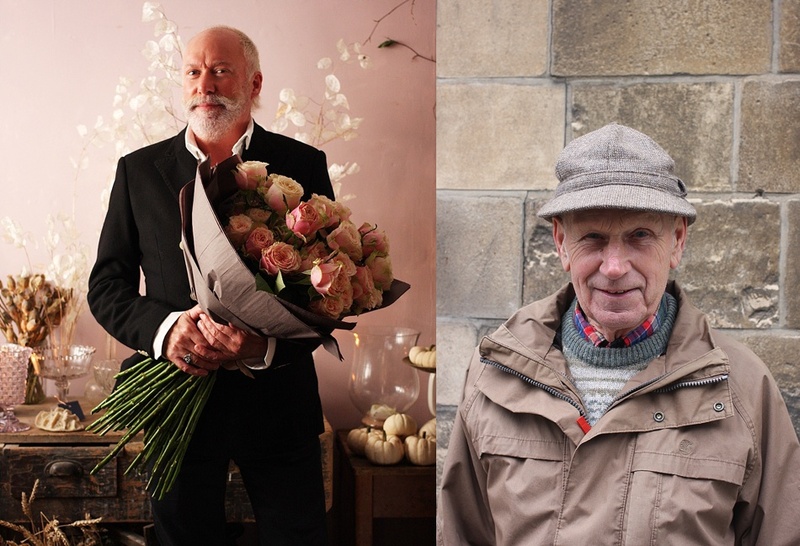 If you follow on Instagram, you will know that I have taken to photograph the people along with the flowers. The pink wall providing the backdrop. 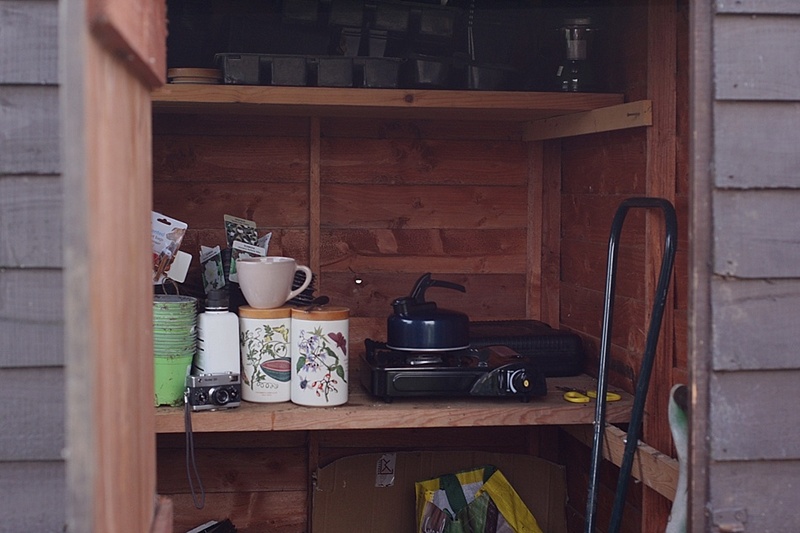 I have also now turned ,my attention to the other plot holders at the allotments. It started after I found an old packet of Tripleprint photographs, do you remember those? before we photographed every little thing on our phones, there was the family camera, reserved for holidays, birthdays and Christmas. Filling out the slip and posting it off with a roll of film and a cheque, what seemed like years lately an envelope would arrive, memories spilling out. The photographs i found were of a holiday, St. Tropez from the look of the coastline, 20 years ago from the look of the very fresh faces. Faces being the point of this particular ramble. In years to come will we look back at our pictures and wonder why we were so obsessed with capturing that cup of coffee on the marble table? I expect so. How many sunsets are too many?, and flowers for that matter. When what needs to be documented is not the flowers, but the people who buy them and the people who receive them. But photographing people is much harder than the flowers. It requires a level of intimacy that can make both subject and photographer uncomfortable. Men seem to feel happier about it than women, we are far more caught up in the physicalities. There are some people i am too shy to ask, some I know would say no, and others who might say yes were it not for their chosen profession. I am convinced one of my customers is a spy. He strongly denies it, but then he would wouldn't he? 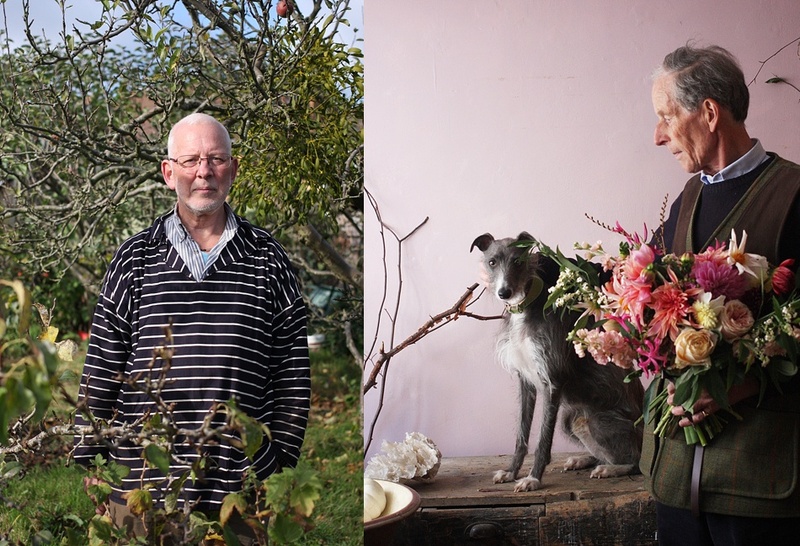 Top row Simon - allotment guru, Kenneth and Valentine Bottom row- Roger and my beloved Thomas who needs to be re shot in front of the pink wall. Last week two ladies came to the shop. "We know of you by reputation, but I was expecting someone a lot older perhaps with a bun and a long skirt" said one of them. I apologised for not having lived up to the image in their heads, I apologised for not being an elderly lady. They left saying how lovely the shop was, how charming my flowers, how odd it was that there was an actual dog in the window, but they also left a little disappointed in the actual real life Miss Pickering. It is a strange thing when we know of people either through social media, films or books. When your favourite novel is turned into a film and the lead is not at all how you had envisaged them. Working on the allotment has opened up the opportunity to listen to podcasts, time is told by how many episodes of Private Passions have been listened to. I thought it might also be a good opportunity to listen to audio books, dead heading to Tolstoy, hoeing to Hardy. Being read to is a very intimate thing, and audiobooks are not. I was left disappointed by the narrators, irritated, disappointed. Sadly i have yet to find any read by Rylance, Rickman or Horden. Not a local firm of solicitors, but Mark, Alan and Sir Michael. All three at my fantasy dinner party for their utterly beguiling voices. and this is supposed to be about dahlias and rainbow chard. 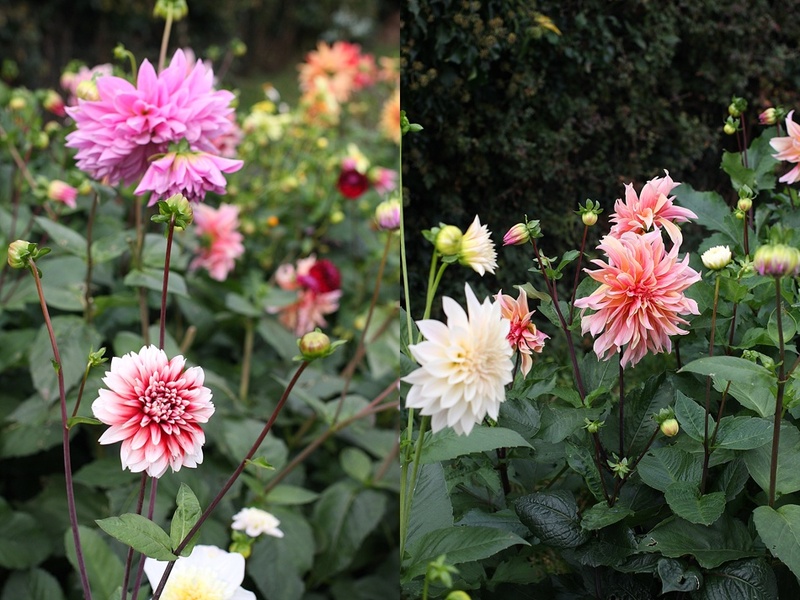 Of all the flowers I have grown the dahlias have been my pride and joy. Prolific flowerers, showy, a little too showy sometimes, all the shyness and reserve of a reality television star desperate to make their 5 minutes of fame count. They just keep coming. and the chard. I didn't intend to grow many vegetables, the rainbow chard was grown for the stem. The rich tones very useful for foliage, for lining vases, and eating. 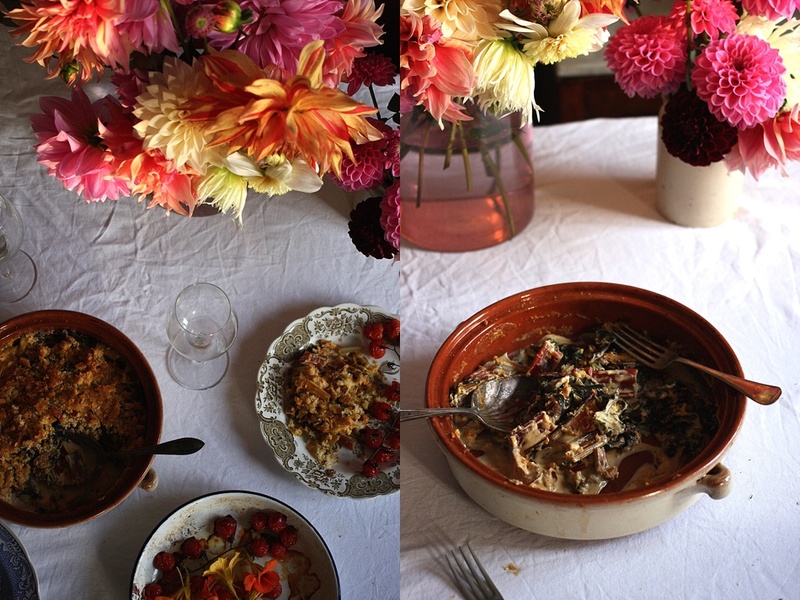 Once the chard went in, it was followed by beetroot, lettuce, spinach, celeriac, squash, the marriage of food and flowers firmly cemented. Chard has a wonderful earthy, slightly bitter flavour that is greatly enhanced by smothering it in cream and breadcrumbs. You have to treat the leaves and the stalk as two separate entities. Chop the stems into inch long pieces, sauté in a pan for 5 minutes, then add the chopped leaves and cook until they just wilted. Tip all of this into a shallow baking dish, add some chopped garlic, salt, black pepper and a good grating of nutmeg. You could also add mustard powder. Pour over cream, i used soya here but single cream or if feeling gluttonous, double would work too. It needs to just cover most of the chard. Sprinkle two large handfuls of breadcrumbs, some parmesan or nutritional yeast, a shake of olive oil and bake in the oven for half an hour or so at 190. Serve with roast tomato, the sweetness and acidity cutting through the cream. Leftovers can be swirled through hot pasta with a little of the cooking water, or served on toast. You can also use this recipe but substitute the chard for any other leafy green vegetable. It is warm and comforting, a little old fashioned.